Quickstart for OutlookPrinter - Print Outlook emails in a customized way. 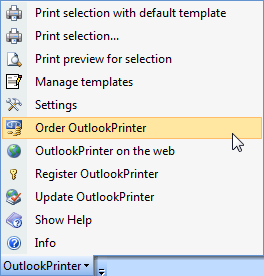 Open your Outlook after you've installed 'OutlookPrinter'. First of all you will see a reminder that you use a trial edition if you didn't buy OutlookPrinter already. With this step your Word will be opened with the default template. The template word file is filled with the content of the selected email and this new created document is sent to your default printer. Click on the 'OK' button and the print process will be started. You see the progress in the next dialogue. If you don't want want to see this report after every print job you can check the option 'Don't show this report again'. This short tutorial should show you how easy it is to print out your Outlook emails with a customized email template. "OutlookPrinter" runs on Windows 2000/XP, Windows Vista and Windows 7 with Outlook 2000, Outlook 2002 (XP), Outlook 2003, Outlook 2007 and Outlook 2010 (32bit).